Dental Office of Donald Hillock, DDS. 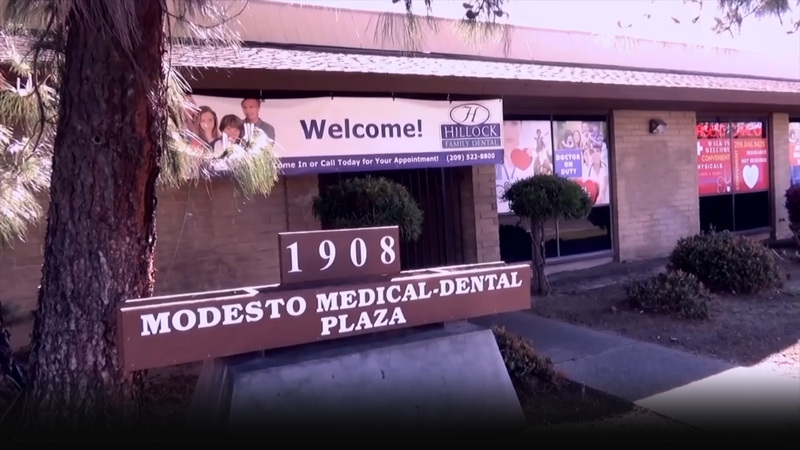 We are a family friendly dental practice, home of Dr. Donald Hillock - top dentist in Modesto, CA. We are devoted to restoring and enhancing the natural beauty of your smile using conservative, state-of-the-art dental procedures that will result in beautiful, long lasting smiles! We also practice Orthodontics. Ask about our new Cosmetic Orthodontics for adults. When you know your teeth look healthy, straight, and bright, you smile freely, and more often – you feel confident. While there are some of us who were born with perfect teeth, it is not common. At Hillock Family Dental we can help you have healthy, straight teeth and keep those smiles coming! We treat patients of all ages, from toddlers to the elderly, and do all we can to make your visit something you enjoy – not dread. If you are looking for the best cosmetic dentist in Modesto, contact our office. Our team of dental professionals has sought out the most advanced methods to replace missing teeth with modern implant dentistry. Whether you have lost one, two, or all your teeth have been irreparably damaged, we have the technology to restore them and bring back confidence in your smile. With these modern techniques, your new teeth will look and function exactly like natural teeth. You can eat and drink everything you enjoy, without the fuss and bother of partial or full dentures. Explore your options! Dr. Hillock and his entire staff are EXCELLENT in every way! Their professionalism is hi-tech stellar and yet delivered in a warm personable atmosphere. They do a great job and all the staff are as friendly and competent as can be. Dr Hillock and his staff are amazing and wonderful!! My daughter and I both love going there!!! At Hillock Family Dental, we treat you like members of our family – we care that much. Our goal is to provide you with top-quality dental care throughout your life, and to help every member of your family. Whether you are considering a cosmetic enhancement, teeth whitening, or have a dental issue you need to solve, Dr. Hillock - a top general dentist in Modesto - is committed to providing dental and oral care in a relaxed, warm atmosphere, where you comfort is a top priority. in a warm, friendly office.
" Our patients are important to us, and I have chosen every member of our team for their professional skills, and for their warm and friendly personalities. Why? I believe dentistry doesn’t have to be painful or stressful. Your experience matters – and we do all we can to make it pleasant and pain-free. " Experience pain-free dentistry at Hillock Family Dental. While there are some of us who were born with perfect teeth, it is not common. At Hillock Family Dental we can help you have healthy, straight teeth and keep those smiles coming! We treat patients of all ages, from toddlers to the elderly, and do all we can to make your visit something you enjoy – not dread. If you are looking for the best cosmetic dentist in Modesto, contact our office. Where The Patient Experience Matters. Dr. Donald Hillock, has dedicated his professional career to creating beautiful smiles. He has extensive experience in the most modern dental techniques, including cosmetic procedures. He lives and works in Modesto and has deep and genuine care for his patients. As a family dentist, he is happy to treat patients of all ages, and from all walks of life. Dr. Orianna Sarkissian is a valued member of the Hillock Family Dental team. Her warmth of character and exceptional skills in the dental arts have made her one of Modesto’s most popular dentists. Her background and education are outstanding, and she continues to expand her skills by staying abreast with the latest developments in the dental arts. The primary reasons for considering an All-on-4 are obvious. You will regain the functional benefits of natural teeth and improve your general oral health. You will regain a healthy-looking, natural smile and the confidence and ease with others that comes with that. Are you missing one or more teeth? If so, you’re far from alone. It has been estimated that 178 million Americans are missing at least one tooth. A single tooth implant offers you the opportunity to replace a missing tooth with a permanent, fixed tooth that looks and functions exactly like a natural tooth. You’ll be able to care for your implant in the same way as you care for your other teeth.